Who doesn’t love a good dip? Dips are very American, in my opinion, because they typically include at least two of these nationally heralded food categories: a) cheese (especially cream cheese/queso/cheddar); b) fatty meats such as bacon and sausage; c) chili; and d) dressings/buffalo sauces/hot sauces. In this spirit, I have created a dip that combines a) + b), plus two more delectable components. Specifically, this Ricotta Bacon Date Dip contains only four ingredients: the namesake ricotta cheese, bacon, and medjool dates, plus honey. I love ricotta cheese and have been looking for an excuse to cook with it for a while now. I love its creaminess, its mild flavor, and how well it melds with both sweet and savory elements. Similarly, I like the fusion of dates, bacon, and honey. The dates and the honey lend a rich sweetness, while the bacon complements with its salty savoriness. It’s a no-brainer of a combination! And while you wouldn’t consider this dip a health food per say, it does pass the whole-foods test – no highly processed ingredients included here – so YAY! You can feel good about serving it to your family and friends – especially if you are able to find or make an organic ricotta cheese (homemade ricotta cheese = a project on my Aspirations list). 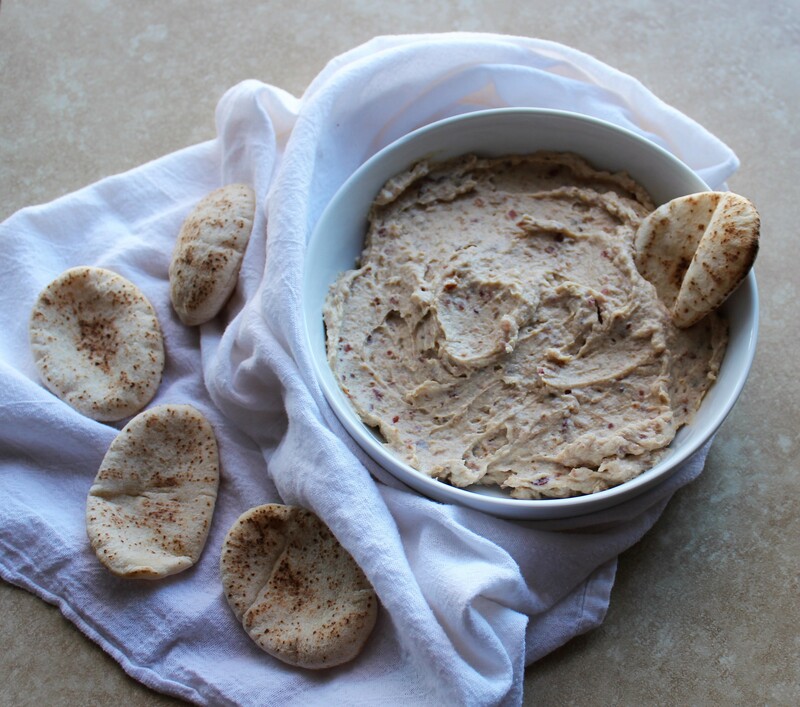 Once you’ve got the bacon cooked, this Ricotta Bacon Date Dip is very easy to whip up. As I’ve mentioned in other recipe posts, I like to cook my bacon in the oven. It’s the easiest, most evenly-cooking method I’ve tried. I line baking pans with tin foil, lie the strips of bacon in them, and bake at 400 degrees for 15 to 20 minutes, or until the bacon is nice and crispy. I highly advocate this method – especially since using the tin foil layer means no messy grease-caked pans to deal with. OK, on to the recipe, and if you’re celebrating the Big Game Sunday, enjoy, regardless of your reason for celebration! Prior to blending, soak the dates in a bowl of hot water for at least 15 minutes. This will allow them to process more easily. Drain the water from the soaked dates and add them to a food processor or blender; process until they are chopped up into little pieces. Then add the ricotta cheese, bacon, and honey. Blend until smooth, stopping the processor or blender periodically to scrape the sides of the mixing container as needed. And you’re done! Serve with the pita rounds, bread, or crackers.